Monoprice's Select Series Power Bank provides the power you need to keep your devices charged on the go. Status LEDs show the charge level at a glance and indicate when the Power Bank is charging and how much charge it has left. A built-in LED flashlight provides emergency illumination when needed. Battery Capacity: The 10050mAh battery capacity is enough to fully charge an iPhone® 6 up to 4 times, ensuring that you can keep your phone fully charged over a long weekend of fun and adventure! 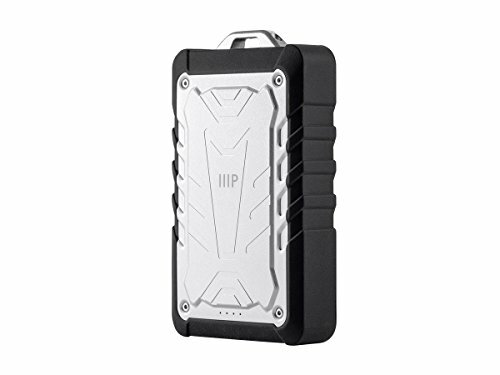 IP65 Rating: The IP65 ingress protection rating means that this power bank is dust tight and can be safely exposed to direct waters jets, so a little rain or dirt isn't going phase it a bit. Rugged Design: The premium aluminum case makes this power bank ready for even the roughest duty. You're not going to worry about dropping it and cracking open the case, like can happen with an ordinary plastic-cased power bank. Toss it in your backpack and trust that it will be ready for use when you need it.